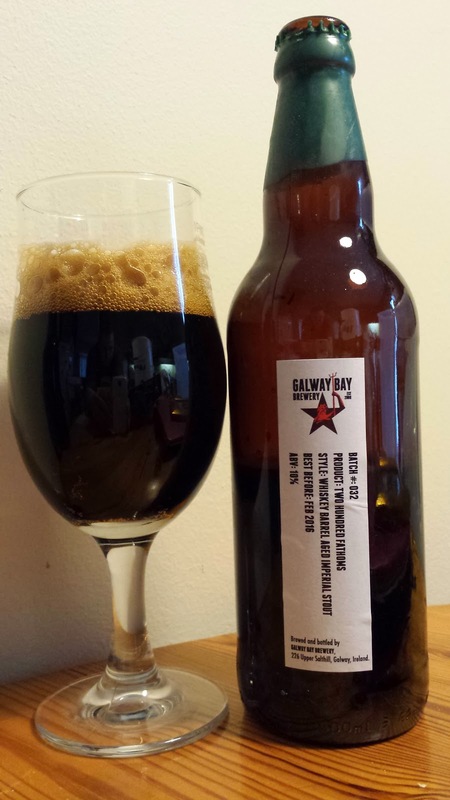 Galway Bay Brewery has consistently brewed awesome beer since Chris took over brewing operations. Chris is very young and his enthusiasm shows in the beer he produces. He has taken Galway Bay from a bunch of pubs serving half decent beer from the brewpub in Salthill to probably the most exciting brewery on the island of Ireland. Last year, they moved production from inside the Oslo to a newly built facility in the attached buildings behind the pub and took delivery of a shiny new brew kit. They have already outgrown this facility and are moving production elsewhere. I am reminded of The Porterhouse in this respect and they went on to be Ireland's largest independent microbrewery. More recently, their double IPA; Of Foam and Fury not only won best beer of 2013 as voted by Beoir in it's 2014 awards earlier this year, it also won gold during the Dublin beer cup a few weeks ago. So how is the beer? Well, if you take a sniff, you get an instant hit of chocolate and vanilla. Nose a little more and you get whiskey and a hint of ash along with a little espresso. Finally, you take mouthful and notice a creamy texture and milk chocolate flavour. After a moment, some warming alcohol and whiskey notes there’s a little espresso but not too much. The beer is a 10% Imperial stout aged in whiskey barrels, though I'm not sure what barrels they used but I can take a guess at an Antrim based distillery. 200 Fathoms is a limited 800 bottle release available only from Galway Bay pubs for €7.50 per 500ml bottle. My advice is buy two or more. One for now, the other to age a year or more. You will have to be quick as they are selling out fast. If you really want to try one, tweet your local Galway Bay pub either in Galway or Dublin and they will be happy to keep some for you as long as you collect it by the next day or so. I read somewhere it was aged in Yellow Spot barrels.